4 sheets phyllo dough (13×17 in. Prepare gravy mixture: Preheat oven, 450. Snip parsley. Combine 1/4 cup of parsley, gravy, cream, seasonings in to a small bowl. Prepare filling: Shred chicken. Add oil to 10 inch stainless steel skillet that is oven safe up to 500 degrees F. (do not use nonstick cookware); heat over medium heat 1-3 minutes or until shimmering. Add pressed garlic to skillet; cook 1-2 minutes or until fragrant. Stir in gravy mixture, chicken, vegetable blend and artichokes; cook 3-4 minutes or until heated through. Remove skillet from heat. Assemble pot pie and bake: For crust, place one sheet of phyllo on counter top, spray with nonstick cooking spray. Place second sheet of phyllo over first, pressing together to seal. Repeat to form a stack of four sheets. Place phyllo over chicken mixture, gathering to fit inside skillet. 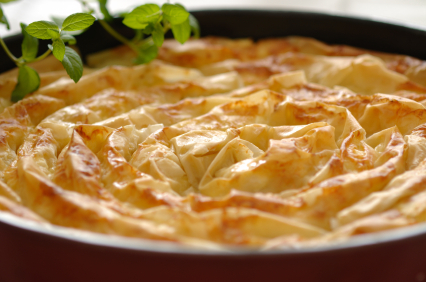 Spray phyllo with nonstick cooking spray. Bake 15 minutes or until phyllo is golden. Remove skillet from oven; sprinkle with remaining parsley and serve immediately. This looks and sounds delicious! It is snowing here in the North East….I am so done with winter. I’m glad you and your family are enjoying some time away. Ummm, this sounds so delightful….and pretty, too. Can’t wait to try it. I just love the Pampered Chef recipes and this is a good one. Thank you for sharing and hosting us today. Have a wonderful Holiday with your family! Sunny Florida sounds pretty nice right about now! Enjoy your vacation! This sounds delicious and I can’t wait to try it. I might have to make it this week. I have a great pot pie, but I am always game for something new and I love the idea of the asparagus, artichoke hearts and phyllo dough. Thank you for hosting us today. Saved it to my computer, can’t wait to try it. My middle child loves pot pie and I’m always looking and trying for the perfect one. The pot pie looks great! I’ll bet that crust is awesome, thanks! Your Phyllo pie looks so good. I love cooking with Phyllo pastry. Glad you are having a lovely time in Florida – family breaks are wonderful! I do like the sound of your skillet fillo pie – Thank you for hosting Tempt My Tummy Tuesday! Pot pie definitely is a comfort dish. Have a great time in Florida! Love all the pics!! Honestly, phyllo dough intimidates me. Maybe I’ll try … 🙂 It looks amazing! You are so right – winter is not over in the Midwest! A trip to Florida and some comfort food sound just about perfect right now! That looks simply delicious! Definitely a recipe for my file! Thank you. I’m so glad I found you!! I’m your newest follower. Great blog!! Hope you enjoy your trip in Florida!! This recipe looks sooooo good! Thank you again for hosting this link up party! I love Pampered Chef recipes! Thanks for sharing and hosting this wonderful Blog Hop! Just wanted to stop by and say Hi! I’ve been so swamped I haven’t been over lately. Looks like lots of yummy recipes! Hope all is well! Oooo I could use some of that comfort food right now. I love the idea of using Phyllo dough as the topping. Hmmm…. Not Inadequate » Blog Archive » Mmmmm…..Bacon….. Previous post: A Magical Day!